HKS Pro Twin/Triple-Plate комплекты сцепления. The HKS GD Clutch Pro is available in twin or triple plate applications; which are capable of handling 600HP and 1,000HP, respectively. Each GD Clutch Pro is vehicle specific allowing for bolt-on installation. Certain applications have an available slave cylinder rod that increases travel for enhanced pedal modulation. A key component delivering engine power to the drivetrain is the clutch. On highly tuned vehicles the stock clutch quickly becomes obsolete because it does not have the friction material nor pressure to hold and transfer the additional power. Therefore a high performance clutch is needed to support and deliver all the engine power to the cars wheels. 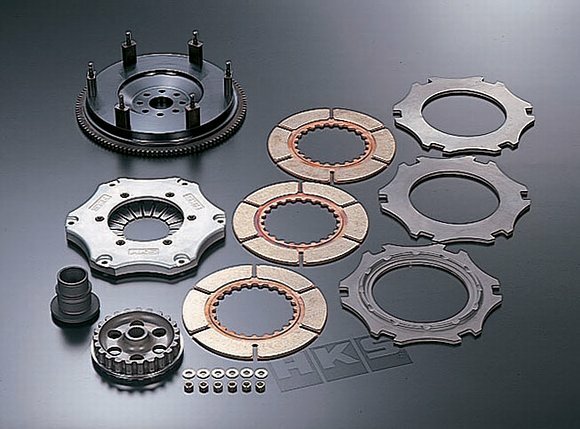 From using the T-002 and R33 DRAG GT-R to develop, test, and research the technology and dynamics of power transfer, HKS has created the HKS Twin and Triple Plate Clutch kits to surpass the demands of a high performance clutch. Twin Plate Clutch kits are designed for 700hp street use applications and the Triple Plate Clutches can handle over 1000HP, which are designed for drag racing applications.